Full lace cap wigs with ear-to-ear stretch have a stretch panel (elasticated lace) that runs from each ear across the wig, with the rest of the lace wig cap being made from lace. The stretch panel will always be a different colour to the lace because it contains elasticated material but it will still be breathable. 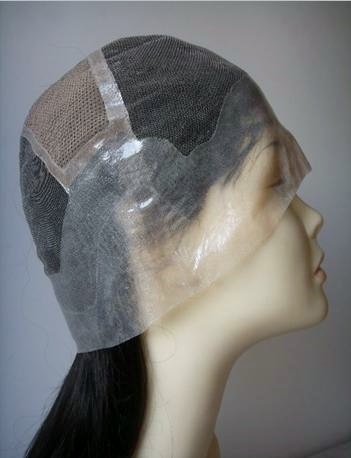 This type of lace wig cap construction means that the stretch panel can add extra room to the given circumference of a wig. There is usually an extra inch (0.5 inch at each ear) but sometimes more – it’s important that your chosen retailer lets you know how much stretch there is. The standard medium cap size of 22.5 inches for a full lace cap wig would fit a head of up to 23.5 inches. It also means that if you have lots of growth hair (in density, length or both) then the stretch panel for the full lace wig cap will accommodate it. The ear-to-ear stretch panel is also more robust than the rest of the lace and is the reason that you can easily roll the wig back to this point in order to fit your wig on your head. This is by far the easiest full lace wig cap construction to use and is a great option for those who are new to wearing full lace wigs as well as being popular with those who have worn them for some time. Adhesive is not used for the stretch panel at the ears – this does not make the wig less secure as the lace is glued from the temples, around the front of the hairline, as well as from just behind the ears and around the nape of the neck. As there is no lace at ears, it means that the hair cannot be worn in a high up-do as the stretch section would show – however our top tip is to simply go for the fashionably tousled (or loose) high ponytail so that some of the hair is covering the top and back of your ears, which means the stretch is out of sight – voila! As the ear-to-ear stretch is a different colour to the lace, it means that the stretch panel can be seen if you want to part your hair through the middle (a half up, half down style, canerows, pigtails and so on). Allows hair to be worn in a (loose) up-do, that obscures the stretch at the ears. Allows the lace to remain unglued at the back – which is useful if you have a daily care routine for your scalp or growth hair. The stretch panel may be visible if the hair is worn with a parting that runs across the panel. The development of different cap constructions for full lace wigs has been a somewhat slow burning affair but the growing popularity of lace wigs has triggered the development of different cap styles. It's easy to be enticed into all sorts of options for your full lace wig cap construction, without really knowing whether you need (or even want) the full complement of accessories.